CHECK BACK TO 'PHOTO UFO' ON A REGULAR BASIS. This photo was taken @ 3 AM on 8-22-04. Computer equalization was used to show UFO activity. The photo above shows several ships. The large colorful round ship on the left appears to be the same kind of ship as the one that I have named the 'Cruiser' (see lower photo on page 2). I also captured one of these 'Cruiser' type ships on my video. I feel that this video verifies many of the photos that I have on this web site. There are indications (engine signatures) of at least three more ships on the right side of the Cruiser. These engine signatures are similar to the ones in photos that I have published on other pages. 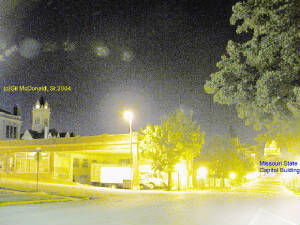 The tall building just to the left of center (with two lights near the top) is the Cole County Court House located in Jefferson City, MO. The court house is slightly more than one block from the camera that took this photo. 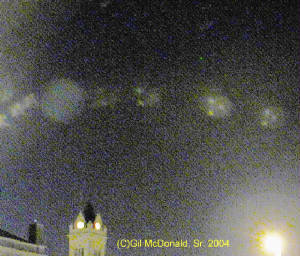 This activity was photographed about 3 AM on August 22, 2004. The poem "Mad Universe" was written by Gil McDonald, Sr. at the age of 22. The location was Simbach, Germany. The inspiration: "Well, whatever happened the previous night may have been the inspiration. I awoke that morning with this poem running thru my mind. The poem was already running thru my mind in its entirety. All I had to do was write it down, word for word, which I did. It is interesting to me that all these many decades later I have forgotten many things. I have forgotten the verses to my favorite church songs, even Amazing Grace, but I have never forgotten one single word from the poem of "Mad Universe". As strange as it may sound, I believe to this very day that it is probably one of the most comprehensive word portraits of the ever mysterious cosmos that surrounds us and envelopes us and, in essence, is us and all of our existance." Until the game at last is checkmate. Creating beings of repugnant resemblance. Is our world, our body, our blessing and curse. To hate it or love it is little consolation. But were I to perish, I never would be glad. Better to be mad and live among the mad. If anyone knows for sure, the answer to these questions, they are not willing to share with the rest of us. Most people figure the U.S. gov. probably knows but doesn't want to tell us. That is a bad indicator. The rest of us just have to go on theory, guess work and our hopes for the future of this planet and its people. For those who do remember a little or a lot of their experience with these creatures no one wants to hear it. Some are afraid to hear it. Other experiencers are among the biggest critics. They are so emotionally connected to their own experience that they feel everyone else must have experiences exactly like the one they remember. Of course, they can always write a book - which cost more to produce than they will ever be able to get back from sales. Maybe some name person will make a movie with a couple of name actors and then -- well, documentaries don't draw much of a crowd or much money so the movie must be structured for entertainment, not facts. Then the investors can hope to make money on their movie investment, but the people who see the movie don't get the true facts. So what can I say about them based on the photos, films and what little I can remember about any personal contact. I have watched some of them in the prison yard. There seemed to be very few grays but the largest population were the gray humanoid ghost creatures. Most of these were of small stature only a couple of feet tall or less. The GHG (that is the term I will use for the gray humanoid ghost) interact with humans by watching while staying out of sight. Sometime they are playful with each other and with humans who are totally oblivious to their presence. They enjoy watching humans sing (make sound) and blow smoke rings (since they probably don't have lungs) and they seem to be absolutely amazed by a fireworks display. The prison for us could have also been a prison for them or perhaps a storage area that was laced with layers of underground departmented tunnels where they conducted their experiments or other works. The GHG may actually be some type of suit or robot that is used by an alien form but the GHG have a life of their own. From what I have seen and experienced I don't think the Grays have the ability to feel emotions as we do. I'm talking about love for others, concern, compassion, hate, bitterness, fear, morals, good from bad, right from wrong, life from death, fear or agression. They have no ability to resist their superiors, never questioning their right or wrong. They don't question their system and they don't rebel against authority. They also may be some form of living suit or robot used by the alien entity. They are not what we can understand as human, and that is (I believe) what they want for us. They want to de-humanize us so we can blend into their population of the Cosmos or be used for other, even more unacceptable useages. We currently have gov. organizations in our society where employees are never allowed to question their superiors and are expected to follow instructions to the death if that is deemed necessary by their superiors. The difference is: It is not in human nature to go thoughtlessly to our death. Everything in humans tells us to fear death. Everything in us tells us to struggle to survive if not for our own benefit then for the benefit of all mankind. We call that bravery. Nor would most humans ever thoughtlessly cause pain or death of another human. But my impression of the alien grays is that they do these things to other aliens and other creatures without even a care or a thought or concern. Yet, in most cases, the grays seem to be able to cause a human to go wherever they want without question or resistance. They know how to play to the human psyche. We are extremely vulnerable in this area. Many people have been convinced that these creatures are our salvation and we should never do anything to resist their will or disturb their plans for us. Several popular movies show that these aliens develop human emotions after being exposed to humans. Don't bet your life on it. We believe that humans have a right to make a choice. The aliens do not seem to believe that humans have any rights. A lot of contactees have the answer to this question. The problem is that they don't all have the same answer. So, where there is a question there is a theory that will answer the question. And there are a lot of theories on this one. For those of you who have not yet completely researched this subject let me just give you a summary. I could almost say that your guess is as good as mine (or anybody elses), but that would depend on your experiences. Based on my experiences I am guessing that they are from outer space, another planet, another galaxy or a whole bunch of other galaxies. They seem to be a lot of different creatures but I can't tell how many of them are of natural creation and how many are manufactured. I can understand why many people think they are from other dimensions or the inner part of this planet. When these creatures suddenly show up or it looks like they just walked into the room with us they sometime look confused as if they are not sure where they are and as if they are having trouble seeing us but they seem to be looking at things that we can not see. That makes it look to us as if it could be a dimensional flux. Still, I believe they are from the cosmos because there are other times when it seems that they definately know exactly where they are and they are there for the intended purpose of conducting business. That is conducting their business, not ours. There are hundreds of thousands (perhaps millions) of people who are personally familiar with alien abductions. Usually their memories have been altered and if they ever remember anything about the real abduction it comes back to them only in short parts or perhaps as if they are seeing a vision. Altered memories always seem to have a very good aspect to the experience, but recall in dreams or visions is usually the opposite. If you are not totally new to researching this phenomena then you already know what I am talking about without going into detail. I have a few of my own experiences to add to this site later, probably under the heading of: What do they want? The question is: Where are the aliens from? The answer is: Many people tell us that they know and they will name what they believe is correct. But in general, the places they name are usually held in general disreguard. So the question remains without a positive answer. The memory of the personal experience is usually altered by the aliens and that makes it difficult to find the truth. If the government knows, once again, they won't tell us because that would be an admission of their knowledge of the aliens presence. I will stick with the statement I made earlier. I believe they are from the cosmos. Actually their orgin is important but what they want is much more important to our survival and that is where we should be concentrating our attention and it should be what determines our reaction to their activities.